This is a 2008 24' Limestone which was first put into the water in 2009. The gel coat is Stars & Stripes. She is used 3 months per year - June, July and August. Washed and waxed each year prior to launch. In the fall, prior to winter storage, she is detailed and the hull waxed. During the season, she is washed with wash and wax after each use. She is stored with shrink wrap over the entire boat. The starboard side is against a dock and protected from the sun. The port side is subjected to the sun. The past 4-5 years, the gel coat has been compounded and polished prior to wax. After compound, polish and wax the boat looks very good; but not the depth of color he had when new. 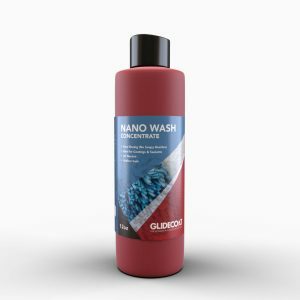 Peter was looking for a solution to restore tired gel coat using ceramic coating. He turned to Glidecoat! 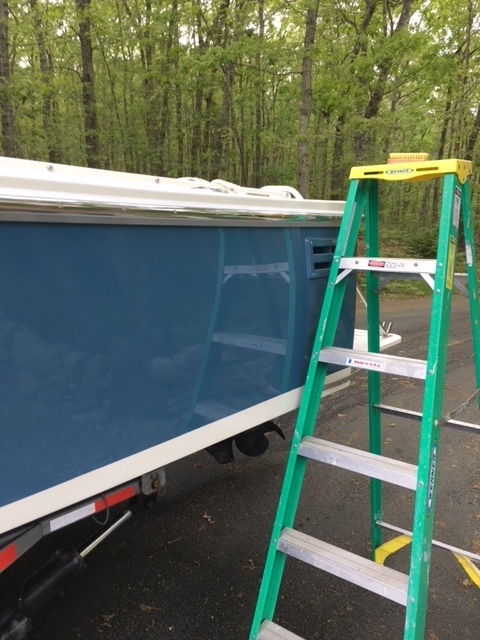 Prior to applying Glidecoat, the boat was washed. The hull sides and smooth deck surfaces were compounded with Nano Compound. There was some oxidization on the aft flatter areas of the port side that face the sun. The starboard side does not get the sun and hull color was a little darker and no oxidization. 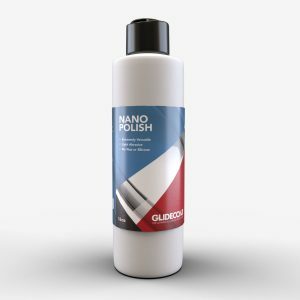 The entire hull and deck was polished with Nano Polish. The complete boat was washed with Nano Wash. The boat was then dewaxed with Surface Wipe. The boat looked good for a 10 year old boat. The color was pretty uniform; but not as dark or as vibrant as it used to be. Shine was good; but not spectacular. There was more variation in color on the port side due to the sun. A dime sized spot of Glidecoat was put on the applicator and was applied to approximately 2' x 2' sections. Making sure the surface was completely covered and overlapping previous sections. You could see Glidecoat being absorbed into the gel coat. Following up behind the person applying Glidecoat was a person wiping and polishing with a micro fiber towel. After the first coat was applied, the hull overall looked better. The color was more uniform especially on the starboard side. There was still noticeable variation on the port side. The depth and brilliance of the color was better. 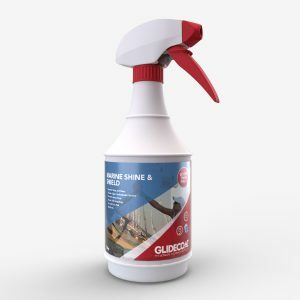 The second application of Glidecoat was applied using the same process as before. One person applying and a second person following behind. You could see Glidecoat absorbing into the gel coat. Instant smile and wide eyes all around. The color on the port side, the side in the sun, was uniform. The color was darker and deeper. The gloss, depth of shine was remarkably better than the first coat. The more you looked at the boat, the bigger the smile. We did a third coat and followed up with a final and fourth coat. After each application, the color and finish looked better and better. The color was darker, deeper and the depth of the shine is better than a new boat. We did the same routine on the smooth white gel coat surfaces on the decks. Subjected to the sun, there was some yellowing which was compounded and polished out. Overall, the white had a shine but not a deep or impressive shine. Despite our effort, the smooth deck surfaces just looked ok. Even when this boat was new, the white was not a deep impressive white. After each application of Glidecoat, the smooth white deck surfaces got whiter, more brilliant, the gloss deeper and the surface smoother. 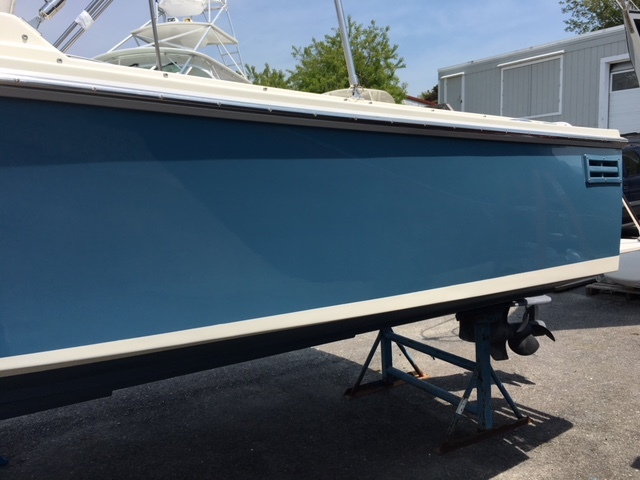 Four coats on the deck left a finish that is significantly better than when this boat was new. She looks better than new. Nothing sticks to the slick surface. 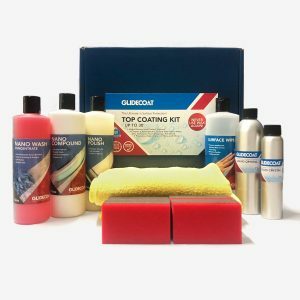 Glidecoat put a huge smile on my face. Click here to read the letter from Peter.